The current market correction is about as fun as a toothache. Made up of a perfect storm of negative sentiment, a slowing global economy and concerns about the end of Quantitative Easing in the US have led to a broad sell-off of global markets, pretty much wiping out most of their gains year-to-date. This is what my screen looked like yesterday (October 15th, 2014). The little 52L that you see to the left of many stock symbols means that the price had hit a 52 week low. The broad nature of the sell off, and indiscriminate selling of every company, regardless of how sound their fundamentals tells us more about market panic than it does about the companies sold. One of the focal points of this correction has been the price of oil, which is off nearly 25% from its high in June. Oil is central to the S&P/TSX, making up nearly 30% of the index. Along with commodities, energy prices are dependent on the expectation of future demand and assumed levels of supply. As investor sentiment have come to expect that the global demand will drop off in the coming year the price of oil has taken a tumble in the last few weeks. Combined with the rise of US energy output, also known as the Shale Energy Revolution, or fracking, the world is now awash in cheap (and getting cheaper oil). But as investors look to make sense out of what is going on in the markets they would be forgiven if all they learned from the papers, news and internet sites was a barrage of fear and negativity masquerading as insight and knowledge. The presumed benefit of having so much access to news would be useful and clear insight that could help direct investors on how to best manage the current correction. Instead the media has only thrown fuel on the fire, fanning the flames with panic and fear. Contrast two similar articles about the winners and losers of a dropping price of oil. The lead article for the October 15th Globe and Mail’s Business section was “Forty Day Freefall”, which went to great lengths to highlight one big issue and then cloak it in doom. 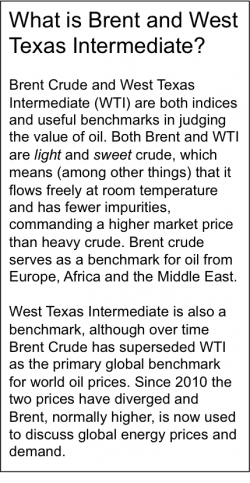 The article’s primary focus is the price war that is developing between OPEC nations and North American producers. Even as global demand is reportedly slowing Saudi Arabia is increasing production, with no other OPEC nations seemingly interested in slowing the price drop or unilaterally cutting production. The reason for this action is presumably to stem the growth of oil sand and shale projects, forcing them into an unprofitable position. This naturally raises concerns for energy production in Canada, but it is not nearly the whole story. The Financial Times had a similar focus on what a changing oil price might mean to nations, and its take is decidedly different. For instance, while oil producing nations may not like the new modest price for oil, cheap oil translates into an enormous boon for the global economy, working out to over $600 billion a year in stimulus. In the United States an average household will spend $2900 on gas. 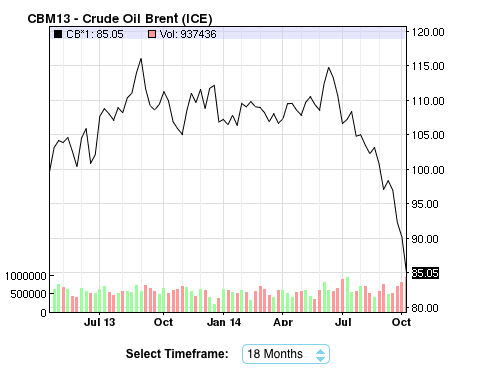 Brent oil priced at $80 turns into a $600 a year tax rebate for households. Cheaper oil is also hugely beneficial to the manufacturing sector, helping redirect money that would have been part of the running costs and turning them into potential economic expansion. It’s useful as well to Emerging Economies, many of which will be find themselves more competitive as costs of production drop on the back of reduced energy prices. 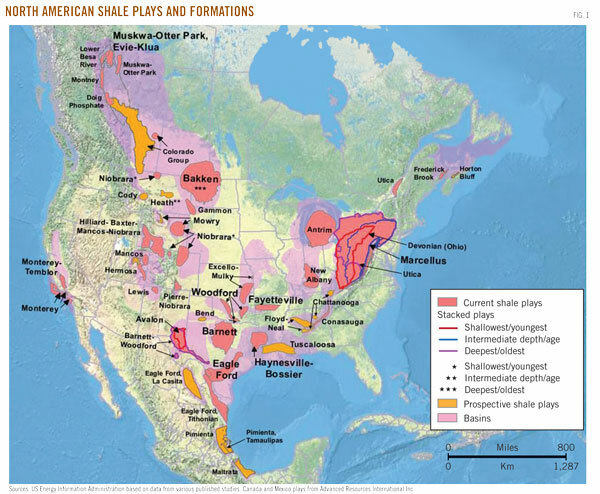 A current map of shale projects, and expected shale opportunities within the United States and Canada. Business Reporting isn’t about business, it’s about advertising revenues. While Canada may have to take it on the chin for a while because of our market’s heavy reliance on the energy sector, weakening oil prices also tends to mean a weakening dollar, both of which are welcomed by Canadian manufacturers. Corrections and changing markets may expose weaknesses in economies, but it should also uncover new opportunities. How we report these events does much to help investors either take advantage of market corrections, or become victims of it. As we wrote back in 2013, business reporting isn’t about business, it’s about advertising revenues. Pushing bad news sells papers and grabs attention, but denies investors guidance they need. ← If I Tell You This is Just a Correction, Will You Feel Better?